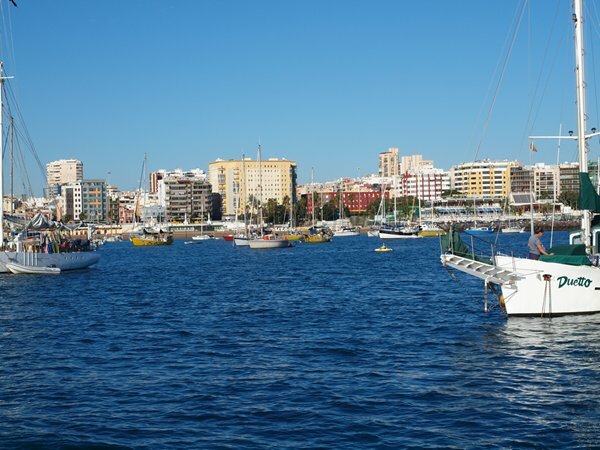 We have spent the past few days anchored in Las Palmas and think we'll be here until mid next week since there is supposed to be a low and some bad weather coming in at the weekend - we need to ensure we are in a Marina for then. 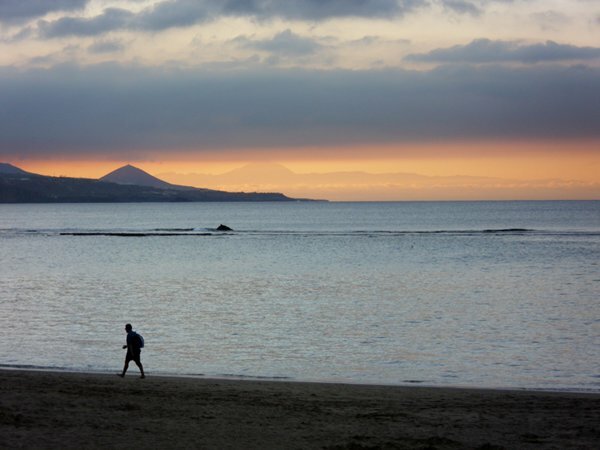 Our first impressions of Las Palmas weren't great - we had gone from being anchored off a white sand beach with clear water to swim in at Fuertaventura, to being anchored just outside the shipping channel of a huge port, we don't go in the water! 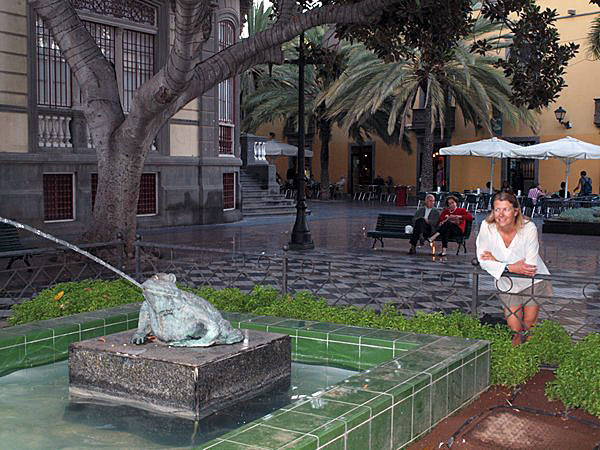 We had ventured ashore into Las Palmas but hadn't really found a centre just apartment blocks and small shops and an 8 lane road behind the marina. However - we have done a bit more exploring since. . . Watching the port comings and goings is interesting - there are container ships in and out all day, most of them pass by and we don't notice - however - yesterday night a huge lorry transporter went racing out of the dock and generated some big waves, I was worried it might sink our dinghy! Today one of the cruise ships is testing all its liferafts so there are loads of yellow rafts bobbing about near it. We finally invested in something called an AIS receiver yesterday - we had been putting it off as we don't like spending money and probably should have bought one before we left - but they are not really that expensive at only about 150 euro's. However - what they give you is very useful - all the ships now have to transmit information about their names, identification numbers, speed they are travelling and direction they are going. After spending hours on our various crossings to get here watching ships and taking bearings or monitoring on radar to ensure they would pass us at a safe distance, our new AIS box picks up all the ships in VHF range and puts them onto our electronic chart for us so we can see our position and their position. We can then see exactly where they are going and what they are called - and so we can call them up and alert them to our position if we think we are in any danger of being mown down! Adam got this working yesterday with both our chart plotter and with electronic charts we have on our laptop. This should make watching ships easier - we'll still need radar in fog as not everything on the sea has to transmit this information, but it will help. At least we could test it was all working by watching the port comings and goings on our plotters. . . then popping head out of boat to see the real boats going past, we have to get our entertainment somehow. 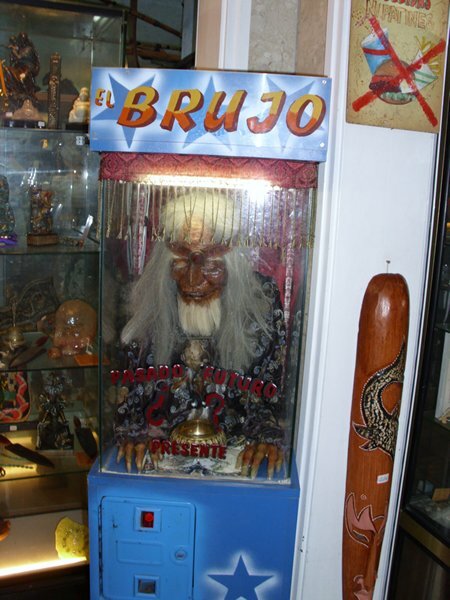 . . . .
We also did a bit more exploring yesterday of Las Palmas and did find the old city which is quite nice - strange to see all the xmas lights up, it just doesn't seem right when it is this warm, the shops have snowmen and snow scenes in the window which looks a bit wierd. We had to take drastic measures to protect our fruit! 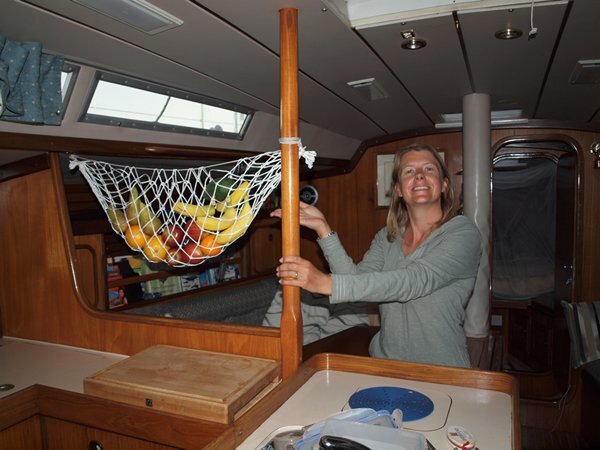 - fed up with buying lots of lovely fruit, putting it in the cupboard, forgetting about it for 3 days then going in and finding it has all gone nasty, so I have purchased some netting and created a beautiful (honest) fruit hammock that is strung across the galley. Adam resisted doing this for a long time maintaining that our boat would look like a 'liveaboard' with stuff everywhere (horror). It doesn't look too bad and now the fruit can swing happily in the air and we will remember to eat it. Adam then made a hammock for the general rubbish that we take into the cockpit so it doesn't end up everywhere and that is strung up in the spray hood with sun cream, water etc - so he has further assisted our 'liveaboard' look. Adam's also attached both our solar panels to the guard rails at the back of the boat and cunningly fashioned props out of a couple of boat hooks - it does look good, you can't tell they were made of boat hooks and with minimal tools. 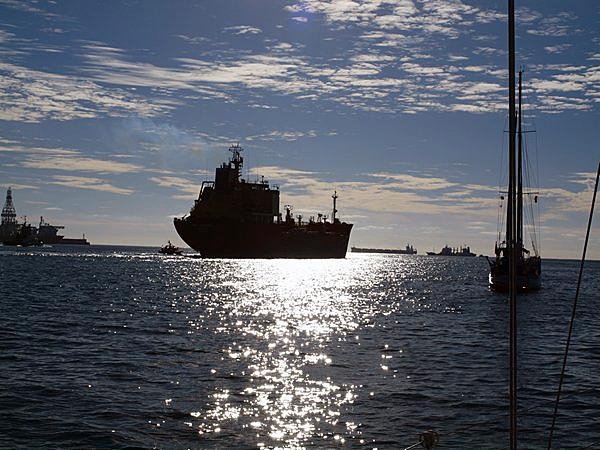 Our View of Ships leaving in the morning!